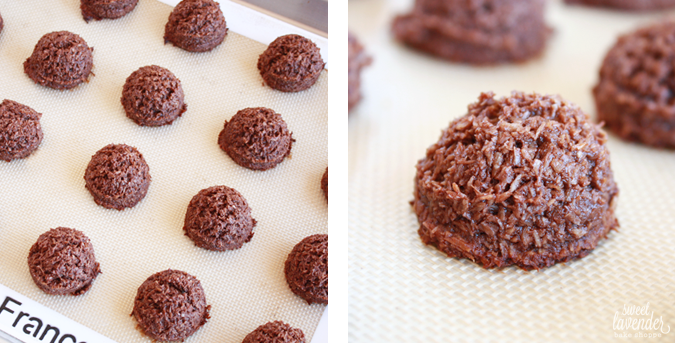 I was a little skeptical at first about making these chocolate macaroons. I was in need of chocolate big time (surprised?). But guys, I'm really trying my hardest to get back on track and not go for candy bars and so forth, that are like, SO bad for me! It was so embarrassing- yesterday I needed chocolate again so bad that all I could do was eat a few handfuls of semi-sweet chocolate chips...standing...munching...making piggie noises I'm sure. Whatever. Then when I went to sit at the computer there was chocolate all over the keyboard, mouse, my hands AND AROUND MY MOUTH! Like I was a two-year old. That friends, is the first sign of a serious problem. Anyway, I tend to really love homemade, honey and maple sweetened things, so these cookies intrigued me because of that. Except! The chocolate came from cocoa powder and for some reason I feel like most things chocolate-a-fied solely by cocoa powder really lack in the chocolate flavor department. I don't want lightly scented chocolate sweets right now. I need like, BIG flavorful, oh-my-gosh-there's-some-serious-chocolate-in-here, punch me in the face, chocolate desserts. 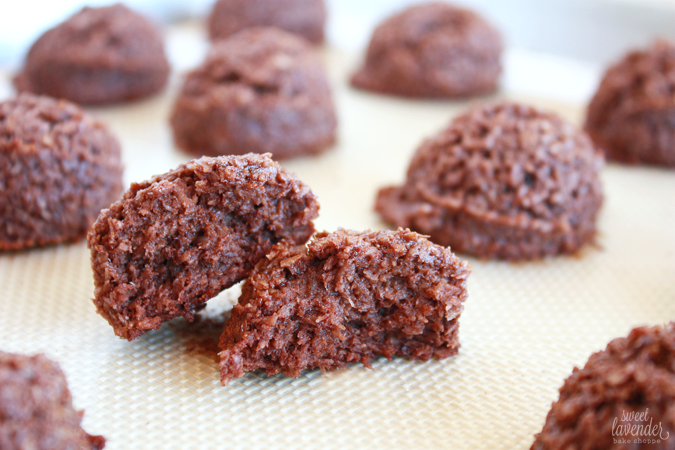 Sure, sure, the original recipe calls for the bottoms to be dipped in melted dark chocolate...but guysssssssss! I NEEDED THEM NOWSIES! I didn't have time to allow them to cool and then dip and then cool and blah blah. I don't know why, but I made these cookies anyway. Holy cow I'm so happy I did! They were fantastic and super chocolaty and oh so goooooood. Super rich, slightly chewy, kind of crunchy on the outside...and literally just what my post-baby, breastfeeding like a mad woman, body needed. The original recipe says it makes 12 but when I used my handy dandy 1 1/2" ice cream scoop I was able to get 40! Perfect size (about two-bites...or one if you're a fatty like my husband). Which makes me think- how big were those darn originals?! Anywho, total win and total score. 1. Preheat your oven to 325°F and make sure the racks are in the center of your oven. Line two sheet pans with silpats and set aside. 2. Into a large bowl, add the shredded coconut, sifted coconut powder, honey, coconut milk, cinnamon and vanilla extract. Using a rubber spatula, stir together well until all ingredients are thoroughly combined. Set aside. 3. Into a smaller bowl, add your egg white and salt. Using a hand mixer (or whisk) beat the egg white until soft peaks form. 4. Gently fold the egg white into the coconut mixture with a rubber spatula, making sure to fully incorporate, but not overmix. 5. Using a 1 1/2" ice cream scoop (or tablespoon), scoop dough out and pack tightly before placing onto sheet pans. These will NOT spread, so feel free to place them pretty close together- maybe 1/4-1/2" apart. I was able to get about 24 on one sheet pan! 6. Bake in the center of your oven for 30 minutes, making sure to turn pans half way through baking time to ensure even baking and coloring. Cool on pan until completely cool to the touch, before trying to remove. 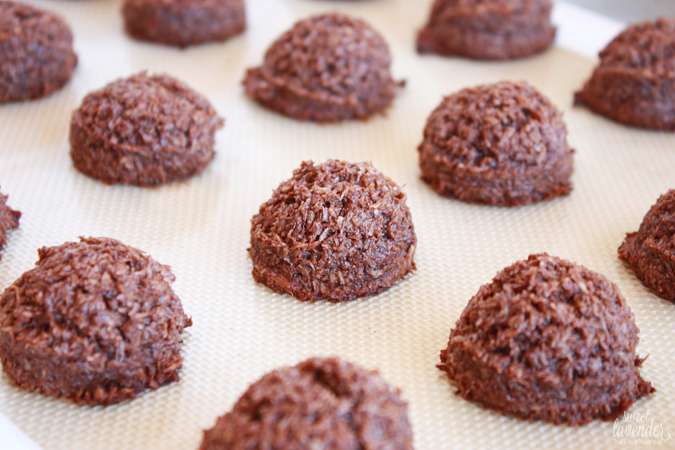 *These macaroons store best in an air tight container in the refrigerator. Recipe from Danielle Walker's, Against All Grain cookbook. I literally ate 5 within the first hour these were made. Don't judge me. These sound delightful! I will have to give them a try!